Classic French vegetable stew, in which chopped Mediterranean vegetables are slowly cooked in herb- and garlic-infused olive oil. Delicious hot or cold. 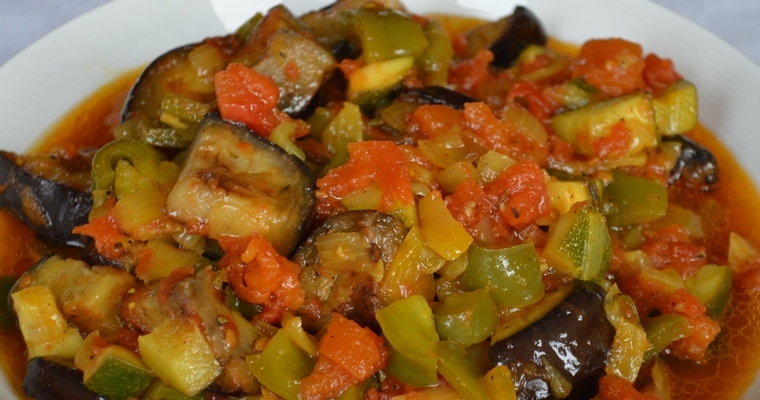 Ratatouille is a rustic vegetable dish from Provence. A mix of Mediterranean vegetables are slowly cooked in olive oil that is seasoned with garlic and woody herbs. The secret is to marry the individual vegetable elements into a single, flavoursome dish, without overcooking into an indistinguishable smoosh. It can be eaten on its own as a main dish, served with a simple green leaf salad and a starchier vegetable like roasted parsnips. Alternatively, it can be served as a side dish with pretty much any animal protein – eggs, fish or grilled meat such as chicken or lamb are all good options. As this supremely versatile dish is arguably even more delicious when served cold, it is nice to have a refreshing batch on standby in the fridge during the summer months! Peel the tomatoes. Place the tomatoes in a large bowl and cover with just-boiled water. Leave for 5 minutes, or until the skins start to split. Drain the tomatoes, then cover in cold water. Once the tomatoes are cool enough to handle, peel off the skin and discard. De-seed the tomatoes by chopping into quarters and cutting loose the seeds where they are attached at the top. Then hold the tomatoes over a waste bowl and scoop out the seeds and white central bits with your thumb. Roughly chop the flesh. Make the tomato sauce. Heat half the cooking oil in a frying pan over a medium heat. Add the garlic and onion and fry for about 5 minutes, until the onion is translucent but not brown. Add the tomatoes, thyme, rosemary, bay leaf, salt, black pepper and, if using, the saffron. Stir until evenly mixed. Cover with a lid and reduce the heat to a gentle simmer. Cook for 45 minutes, stirring occasionally. Salt the aubergine. Meanwhile, place the aubergine in a colander set over a dinner plate. Toss with 1 tablespoon of salt, and leave for at least 30 minutes to allow the salt to draw out the excess water. This will concentrate the flavour and firm the texture, meaning that less oil is absorbed during frying. Add peppers and courgette to sauce. Once the sauce has cooked for 45 minutes, add the peppers and courgette. Cover, and cook on a gentle simmer for another 30 minutes, stirring occasionally. Fry the aubergine. Meanwhile, cook the aubergine. Rinse off the salt and pat dry with kitchen towel. Heat the remaining oil in a large, heavy-based frying pan over a medium heat. Arrange the aubergine pieces in a single layer and cook for 15-20 minutes, until golden brown all over. Set aside. Once the peppers and courgettes have cooked for 30 minutes, add the aubergine, along with any leftover oil from the frying pan. Stir, and cook uncovered for 5 minutes. Taste, and adjust the seasoning if necessary. Once cooked, fish out and discard the garlic cloves and herbs. The stew can be served immediately, but is best eaten the next day when the flavours have had time to develop and meld. Leave to cool before refrigerating, where it can be kept for up to 5 days. To serve, reheat or serve cold once brought up to room temperature.